To me, the two are inextricably tied. Throughout my childhood, a hot pot (or shabu) dinner represented the times when the family came together. Often it would be just our nuclear family. Other times, it would include aunts, uncles, cousins, and even grandparents. Whoever was over, hot pot always meant sitting together, chatting, and cooking whatever we chose in the hot, bubbling broth in the center of the table. I always looked forward to it. When I married into Bryan’s family, I found out they enjoyed a similar tradition. To this day, whenever we go back to California, we always spend at least one meal having hot pot together as a family. So it seemed fitting that when Bryan’s parents visited Boston this past spring, we continued the tradition and had yet another hot pot together. Sure, we also took them to eat all around Boston, everything from an Italian multi-course pasta table dinner and fantastic pizza to dinner at one of our favorite hangouts. However, we did reserve one day for shabu, this time at one of the most well-known shabu places in Boston. Although Shabu Zen is mainly a shabu restaurant, it also offers sashimi and a variety of Asian appetizers. We tried several different appetizers, like the Gyoza ($5), or potstickers, which were good, though not particularly memorable. I really enjoyed the Sauteed Beef Tongue ($7), which was soft and tender and cooked in a flavorful, soy-based sauce. My favorite was probably the Sauteed Baby Clams ($7), which were just cooked in a simple butter and wine sauce, but had tons of flavor. And finally, we tried the Salmon in Ponzu sauce, a tasty and refreshing starter. Despite the use of the Japanese name “shabu”, Shabu Zen has all of your traditional Chinese hot pot ingredients. You can enjoy a more Chinese style hot or a more Japanese style shabu meal. The offerings are quite diverse. For any shabu/hot pot meal, the broth in which you dip (and cook!) all your food is really important. It affects the flavor of everything you eat. The menu includes a good variety of different broth flavors. The restaurant offers pots with a divider, so you can easily try two different broths for your meal. Often we’ll pick one spicy, and one non-spicy. Three basic broths are complimentary: House Special Pork Broth, Chicken Broth, and Vegetarian Broth. Most of the special broths cost only an additional $3, like the Chinese Herbal, Chinese Spicy Szechuan style, the Korean Kim Chee, the Thai Tom Yum, the Japanese Miso, or the Tomato Veggie. The Chinese Spicy (Mongolian style) broth is an extra $5. We went with the Chinese herbal and Chinese Spicy, Szechuan style (I guess we like Chinese broths!). The menu includes both combos (which are sets that include both meat, vegetables, and noodles), as well as a la carte options. The combos are nice to serve as a base, but they typically don’t include the more interesting hot pot ingredients. As a result, we typically order one or two combos and then add a la carte items to it. We ordered the combo with the highest quality beef: Finest USDA Prime Ribeye Beef ($20). The menu also offers a USDA Choice Angus rib eye beef ($18). Each Combo comes with a plate of standard vegetables. including bok choy, napa cabbage, enoki and shiitake mushrooms, corn, carrots, tomato, and tofu. You also get your choice of noodles, either ramen, vermicelli, or udon. The Seafood Supreme ($18) comes with scallops, prawn, salmon, cod, squid, clam, mussels, and fish cake. Sometimes, they even have Wagyu as an option. The chef feels that Wagyu should be enjoyed with this special sesame paste. The sauce totally reminds me of sesame – based sauce I had the time we had Kobe beef shabu in Japan. Though the basic vegetables are fine, I always like ordering some of the more exotic and fun items off of the a la carte menu, like the Assorted Mushroom ($4). Tong hao (Chrysanthamum greens – $2.50) is a bitter yet fragrant green that is a staple in Chinese hot pots. We always get this, partly because we really like it, but also for nostalgic reasons. Make fresh fish paste dumplings by spooning Fish Paste ($4) into the hot boiling water. Shabu Zen’s version is delicious, and frankly much more flavorful than the pre-made fish balls that they also sell. If given a choice, order this over the fish balls. We had a really, really fun time at Shabu Zen. I have a soft spot for hot pots, so it’s not a surprise that I really enjoyed the meal. Furthermore, the entire staff was really, really nice to us. All in all, the food at Shabu Zen is very good. 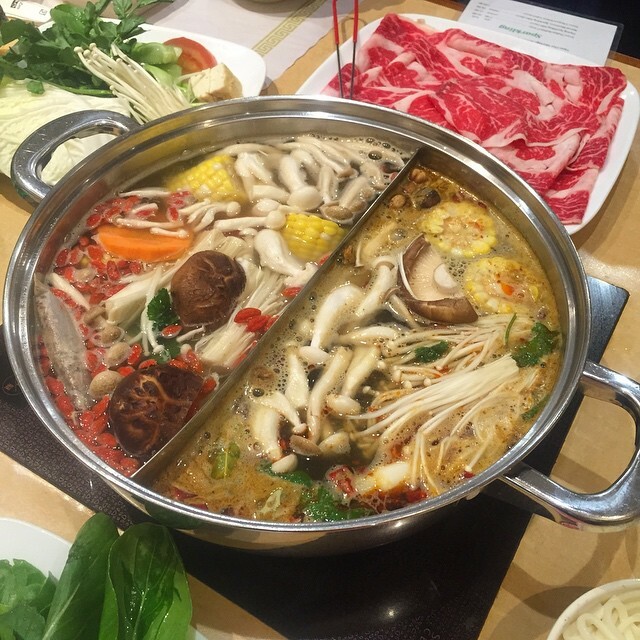 The ingredients are fresh, they offer a lot of quality meat at all different price points, and there’s a good variety of authentic hot pot offerings. I was especially excited about the Wagyu beef, the fresh fish paste dumplings, and the more exotic vegetable offerings. Now that the weather is starting to cool down, I wouldn’t hesitate to come back here with a group a friends (or family if they come visit!!). How did we eat that much food!